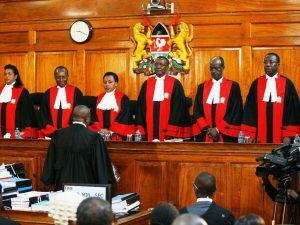 The Supreme Court of Kenya heard a challenge today on the compatibility of the mandatory death penalty for murder with Kenya’s Constitution (Mwangi & Muruatetu v Republic of Kenya). The key issue in the case is whether the imposition of death for everyone convicted for murder, irrespective of the circumstances of the case and of any mitigating features, is consistent with the right to life and the prohibition of inhuman and degrading punishment under the Constitution. The outcome of this case is likely to affect several thousand inmates in Kenya who are on death row for murder or aggravated robbery. Joseph Middleton of Doughty Street Chambers addressed the Court on behalf of The Death Penalty Project, which had been allowed to intervene and make submissions as international experts on the death penalty. The Supreme Court is expected to give judgment in this historical constitutional litigation later in the year.